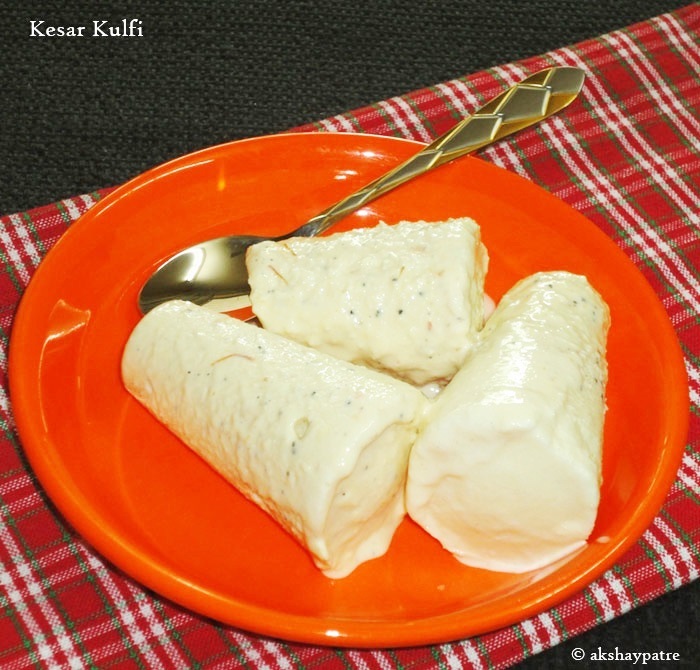 Kesar kulfi is really a delicious, soft and cool dessert one can have during summer. Kesar is known as saffron in English. Saffron can be added to get light yellow colour and a unique adorable flavour to the dish. It gives extra flavour in combination with cardamom powder. 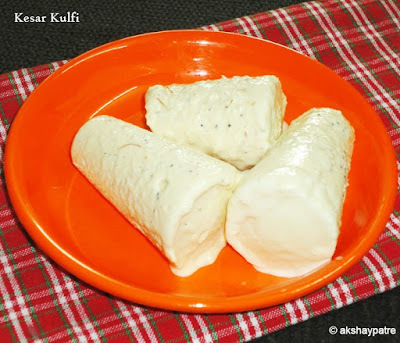 Learn how to make kulfi at home with milk powder, milk, saffron, sugar and cardamom powder. Also check out mango kulfi recipe which I had posted earlier. These kulfis are not only delicious but also melt in mouth. This can be had at any time of the day. Dissolve the milk powder in 1/4 cup of warm milk and set aside. 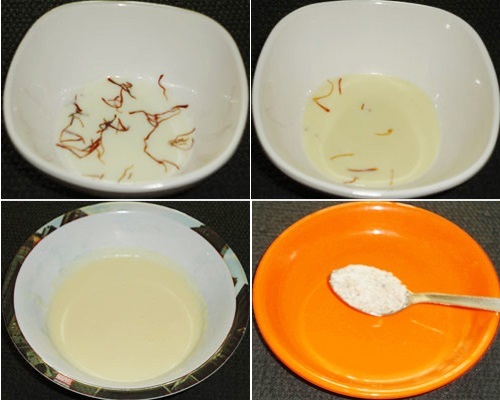 Soak the saffron strands in 4 -5 tbsp of warm milk and set aside for 5 minutes. Pour the remaining milk in a deep pan and bring it to boil. Further, boil the milk stirring occasionally and reduce it to half. When the milk become thick, add the sugar and mix well. Allow the sugar to dissolve completely. It may take 3 - 4 minutes. Then add the milk powder paste and bring it to boil stirring continuously. When the milk boils and turn into thick paste, switch off the flame. Now kulfi milk paste is ready to pour in the mould. 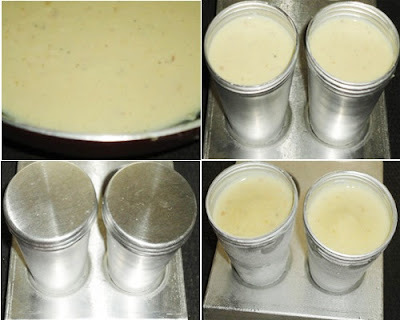 Take the kulfi moulds and pour the above prepared milk paste. Cover the moulds with lid and keep them in the deep freezer for 4 - 5 hours or till the kulfis set nicely. While serving, insert a knife from the edges and separate the kulfis from the moulds. Eat and enjoy. 1. Soak the saffron strands in 4-5 tbsp of milk and set aside for 5 minutes. Squeeze the saffrons nicely with your finger tips. Keep it aside. 2. Put the milk powder in a bowl and pour 1/4 cup of warm milk on it. Make a thick paste and set aside. 3. Pour the milk in a large pan and bring it to boil. 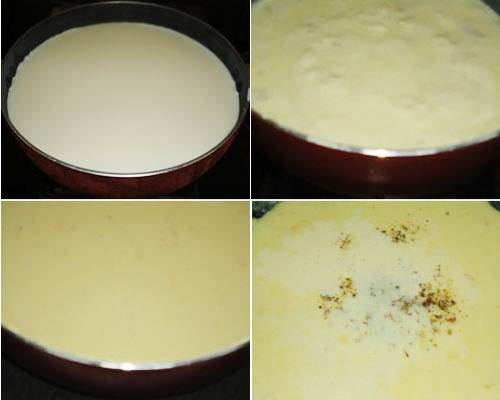 Further, boil it on high flame till the milk reduce to half and become thick. 4. Once the milk become thick, add the above prepared milk powder paste and boil stirring continuously. Avoid any lumps. Bring it to boil and switch off the flame. Allow it to cool. 5. Add the above prepared saffron milk and cardamom powder. Mix well. 6. Pour the above prepared kulfi mixture into the kulfi moulds. Cover the moulds with lid and keep it in deep freezer till they set nicely. It may take 4 - 5 hours. 7. While serving, insert a sharp knife in the mould and separate the kulfis from edges. Transfer the kesar kulfis on a plate. Eat and enjoy. Delicious and low calorie kulfis with just milk powder instead of condensed milk.